Hello!!!! For some reason, Aems and I sometimes blog on the same day, even though we should really alternate days so the posts are spread out. I didn’t feel like searching my inventory for pants, so I’m not wearing any today, but…… I think it works, cos the jacket is long enough. Look at the text on the pocket!! This may not be that funny if you’re a cat lover, but to me it’s hilarious. 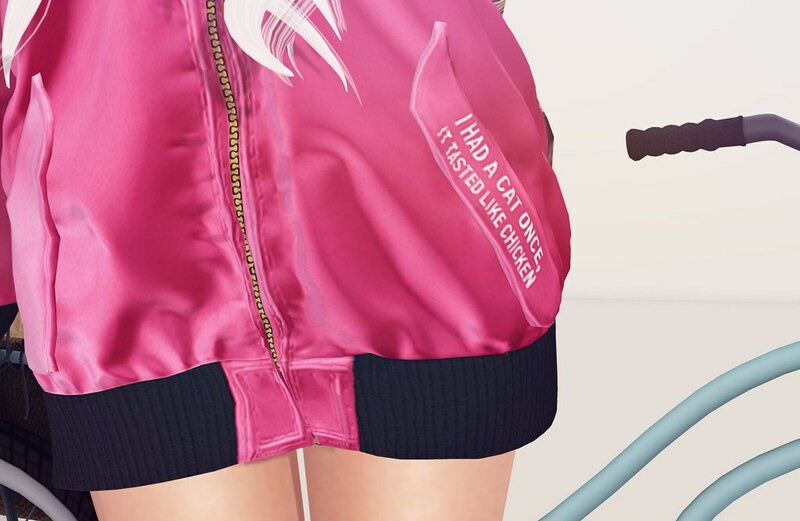 This Oversized Bomber from Monso is especially funny cos there’s a picture of a cat on the back, LOL. Have you seen these gorgeous Farmers Market stuff from Lark? This set brings me joy. I want to ride around my bike along the countryside, singing songs, and getting drunk on fine wine picking fresh flowers.